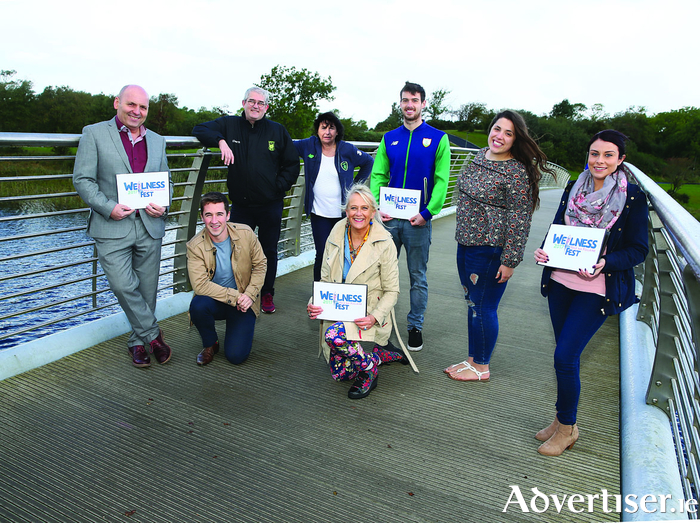 Pictured at the launch of Wellness Fest were back row: Benen Tierney (CRCfm station manager), Michael Baynes (CRCfm Events Team), Mary O 'Reilly (CRCfm Events Team). Olympian Nicholas Quinn, Karissa Van Baulen (CRCfm Events Team), Trish Greavy (manager Mayo Cancer Support -Rock Rose House). Front row: Daithí Ó Gallachóir and Noelene Cashin-Cafolla (CRCfm Events Team). Wellness Fest 2017 – Féile na Folláine, Castlebar’s newest festival, will take place in the Ivy Tower Hotel on Saturday, December 9. The festival is being organised by the CRCfm Events Team, as a fundraising event for Mayo Cancer Support-Rock Rose House and CRCfm. The event will be a celebration of all aspects of wellbeing; it will explore different treatments and therapies, and will also hosts talks from experts in a range of different fields. Dr Prannie Rhatigan, medical doctor with a life time of experience in harvesting, cooking, and gardening organically with sea vegetables, will open Wellness Fest 2017 with a mini seminar and demonstration. Given the inextricable link between Mayo and the Wild Atlantic, this demonstration will prove to be the perfect opening for an event which boasts great variety. Dr. Rhatigan has been hailed as ‘Ireland’s leading seaweed expert’, has represented Ireland’s finest food abroad and has given lectures on sea vegetables and cooking (irishseaweedkitchen.ie ). She delivered the President’s address to the PSA (Psychological Society of America Seattle ) and facilitated a workshop on seaweed cooking with researchers in the USA. She has been featured on many TV and radio shows in Ireland and abroad. Fiann Ó Nualláin, author, broadcaster, TV presenter, Irish Examiner columnist and ongoing advocate of gardening for health and wellbeing, will also be joining the Wellness Fest on the day. Fiann’s background is in medicinal botany, nutritional science, and horticultural therapy, as well as holistic therapies, mindfulness facilitation, and CBT counselling. He has featured on Ireland AM, Nationwide, The Late Late Show, The Saturday Night Show, RTÉ Six One and the Bloom programmes. He has also appeared on TG4’s Garraí Glas, BBC’s Gardeners World, and has co-presented RTE’s Dermot’s Secret Garden with rose and garden guru, Dermot O'Neill. Fiann will be giving a mini seminar on the benefits of gardening for health and wellbeing. A special feature of Wellness Fest is the local therapists who will give of their time, free of charge, in offering the opportunity to experience and explore many different therapies. Yoga, reflexology, aromatherapy, corrective sound therapy, herbal botanicals, touch for health kinesiology, sound therapy and many more. There will also be mini seminars on holistic learning, life coaching, and stress management. Tickets for the day are priced at €30 and allow people the opportunity to book a private session with one of the many experienced therapists, ticket holders will also have the opportunity to attend the seminars with Dr Prannie Rhatigan and Fiann Ó Nualláin. Why not do some unique Christmas shopping from the creative craft community, who will display their handmade products, all of which are made locally. The full timetable of events will be available over the coming weeks. The launch of Wellness Fest 2017 – Féile na Folláine will take place on November 7 at 6pm in the Linenhall Art Centre Coffee Shop. All Star footballer and local entrepreneur Andy Moran will launch the event. This one-day event is about promoting total wellness through mind, body, and spirit connection and is an opportunity to connect with likeminded people.